When the storm hit, bringing down branches and power lines, it turned into a matter of life and death for one family. GRANDVIEW, Mo. — When the winter storm hit, bringing down branches and power lines, it wasn't just inconvenient for one Grandview family. It was a matter of life and death. "It was very, very scary. I wanted to run, but I can't," said Barbara Knight, who's in congestive heart failure and struggles with lung problems as well. The situation inside her home was more dire than the storm swirling outside. Knight's oxygen supply was dwindling. "She can't live without it. She has to have it," said Knight's daughter, Christy Smith. But the power was out, and the company that supplies her tanks couldn't deliver reinforcements. Knight's family panicked. 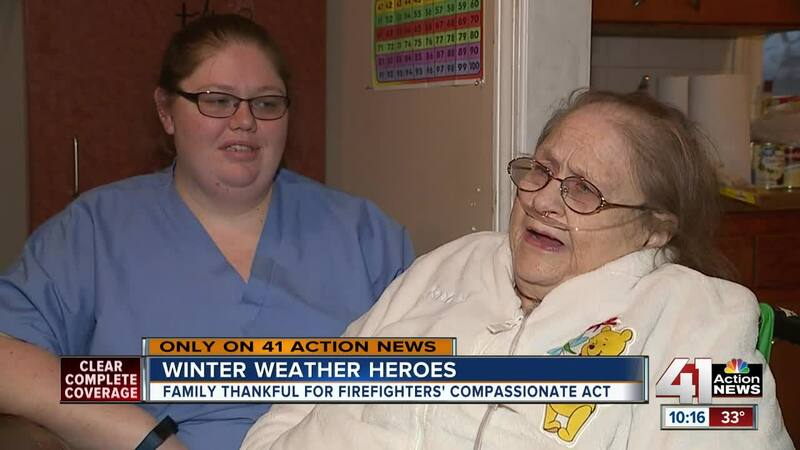 "I was just frozen and scared," said Jacob Gould, her grandchild. "I was like I don't know what else to do. We can't afford a hospital bill," Smith said. Smith decided to call the Grandview Fire Department. Assistant Chief Rob Stottlemyre appeared soon after with several extra bottles and a regulator. "It's just what we do, you know? Try to help people," Stottlemyre said. But Barbara Knight and her family want the department to know the difference they made. "If it weren't for that fireman, my grandma wouldn't be here right now," Gould said. "I can't thank 'em enough," Knight said. The Grandview Fire Department recommends calling your oxygen supplier to stock up before a big storm hits. Knight's family did that in preparation for the winter weather in the forecast.